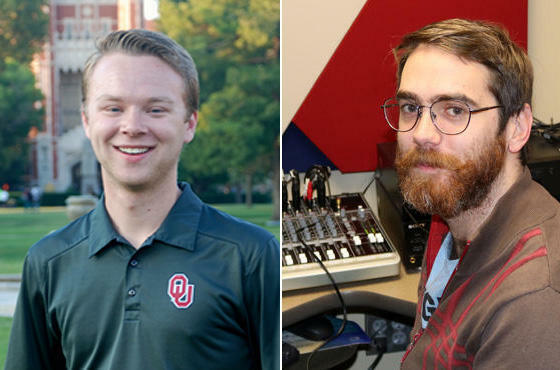 Now that the calendar has turned to December, and the fall semester is ending at the University of Oklahoma, we want to thank the OU students working at KGOU. Storme Jones is host of the noon news, traffic and weather reports and produces special features. Richard Bassett handles the community event calendars, online and on the air, and does audio engineering for local musical performances. Both are paid student staff members, and we’re glad they will be with us over the holidays and during the spring semester in 2017. We had two Practicum students this semester – Ethan Barton and David Ransom. They worked on various projects, including audio editing and preparing promotional announcements. It was great having you part of the team. We appreciate the contributions all of our students have made to the smooth operation of KGOU, and look forward to meeting new students next year.